NARRATIVE: On 11/10/07 at 6:43 A.M. the Spokane Fire Department responded 21 firefighters on 6 pieces of fire equipment to a report of a house on fire at 4328 N. Havana. Fire crews discovered a large two story home with fire enveloping the front porch area and extending to the porch roof above. Crews were successful in keeping the fire out of the interior of the home and quickly brought the fire under control within 5 minutes. Crews remained on the scene for approximately 2 hours making sure the fire was dead out. This activity involved the crews cutting apart the porch roof and using their thermal imaging camera to ensure that any embers remaining were thoroughly extinguished. No one was present at the home while firefighters were on the scene. A fire department investigator is currently looking into the cause of the fire. At this time, it appears that the fire began on the porch floor outside the home. This investigation will continue throughout the day. There were no injuries to firefighters at this incident. The dwelling sustained heavy fire damage to the front porch and roof areas. There was also smoke damage throughout the structure. DAMAGE EXTENT: Heavy fire damage to the front porch and porch roof. Smoke damage throughout the interior of the home. Thanks to Frank W. for this picture that really illustrates the difference in campaign funding. 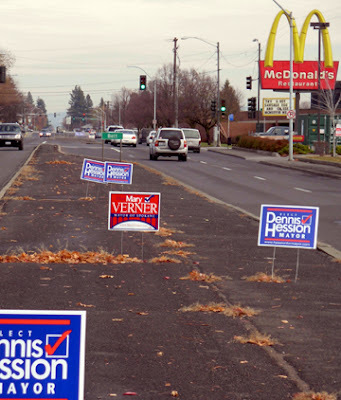 Also, if you see any Mary Verner signs out there on public property, feel free to pull them. They are being collected at the union office. NARRATIVE: On November 8, 2007 at 2313 hours, the Spokane Fire Department received a call for a reported garage fire. The Combined Communication Center dispatched 6 fire apparatus to E. 222 Hoffman Ave. Pumper Ladder 13 arrived on the scene within 5 minutes. Lt. Jamie Newcomb reported that he had a fully involved detached garage fire and was assuming Command. Lt. Newcomb's crew advanced pre-connected hose lines to extinguish the fire while he directed the other incoming fire apparatus and personnel. The firefighters under the direction of Lt. Newcomb knocked down the fire within six minutes. The crews protected several cars that were parked near the garage and one exposure building to the east. There were no injuries reported at this fire. A good deal of material was stored inside the garage and fire crews are expected to be on the scene for several hours removing the fire debris. The fire cause is still undetermined at this time. Early indicators are directing us towards an old wood stove that had been in use earlier this evening. 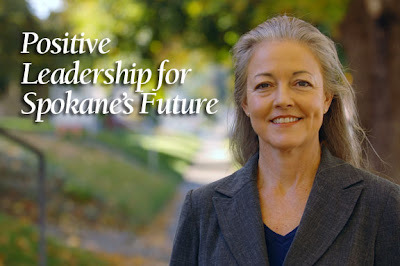 Great news for all of Spokane. Excluding people to the bitter end. At least he's consistent. If you helped with Mary's campaign and want to be with her when the election results come in, be at the Red Lion River Inn, 700 N Division, at 7:30 PM On Tuesday, November 6th, to wait for the election results. There will be snacks, drinks, and a no-host bar available.